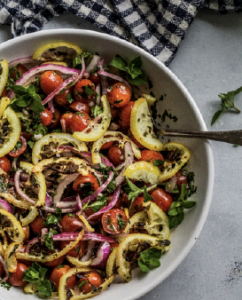 This cherry tomato salad with roasted lemons is the perfect side dish. Sweet tomatoes combine with a tangy vinaigrette and delicious roasted lemons. Fill a small saucepan with water and bring to a boil. Add lemon slices and blanch for 2 minutes. Drain well. Combine 1 tablespoon oil, sugar, oregano and 1/2 teaspoon salt in a small bowl. Add lemon slices and mix well to combine. Spread the lemon slices out in a single layer on a baking sheet lined with a silpat or parchment paper. Bake for 30 minutes. Remove from oven and allow to cool. 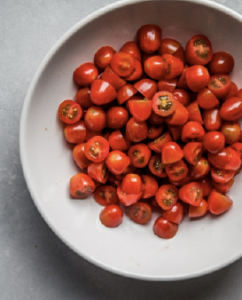 Combine the tomatoes, remaining 2 tablespoons oil, 1/4 teaspoon salt, pepper, vinegar parsley, mint and onions in a bowl. Add the lemon slices and stir gently to combine. Taste for seasoning and adjust as desired with additional salt and pepper. Serve immediately.